Rebekah Brockman and John Evans Reese in A Taste of Honey. BOTTOM LINE: A generous attempt to revive a run-down 1950’s kitchen sink drama. A jazz trio sets the scene on a large, dilapidated apartment in a poor district of Manchester, England during a rainstorm. Helen (Rachel Botchan) and her daughter Jo (Rebekah Brockman) burst into the flat, soaked to the bone and weighed down with suitcases. The pair banter back and forth while they unpack, each delivering direct address asides to the audience about their resentments toward the other. Their relationship is past the point of strained; they have little money, their living conditions are less than ideal, and Jo keeps changing schools on account of Helen’s frequent need to skip town. Helen is a “good time girl” who likes to drink, and finds herself caught up with the wrong kind of man. Jo resents her mother’s dalliances and plans to earn her own money so that she can get away from her. Just as they’re getting settled in, Helen's brash boyfriend Peter (Bradford Cover) comes looking for her. Jo and Peter instantly don’t like each other and each fight for Helen’s affection, but as with all of her past lovers, Helen choses her beau. Later, while Jo walks home with her boyfriend Jimmy (Ade Otukoya), he presents her with a ring and asks her to marry him. She agrees, although he is in the Navy and will be away for at least six months. Jo ties the ring on a ribbon around her neck and hides it under her clothes to keep it from her mother. Helen returns home to tell Jo that she is marrying Peter and leaves Jo on her own for Christmas. That night Jimmy returns to console Jo and they spend their first, but fateful, night together before he heads out to sea, leaving Jo to fend for herself in a unforgiving world. A Taste of Honey was the late British playwright Shelagh Delaney’s first play and it garnered her immediate success in the late 1950s. While sprinkled with humor and heart, the play feels untethered to structure and a bit too sentimental at moments—perhaps typical of a young writer (Delaney was 18 when she penned it). Still, the play does well to highlight many timely biases, including race, homosexuality, poverty, and the role of women in society. Directed by the accomplished Austin Pendleton, there is a strong sense of honoring the playwright’s intentions within his direction. Further, Pendleton’s creative use of the excellent jazz trio (Phil Faconti, Max Boiko, and Walter Stinson) adds humor and levity to the ends of the scenes, while smoothing the transitions throughout. To be certain, A Taste of Honey is a bit odd. While everyone tries their best with the text, there is a whole lot of exposition, and much of the same argument in the banter. There are also strange musical moments where characters break into song—it is unclear if these are part of Delaney's text or have been added by the creative team. And it's easy to feel lost, since the rules of the play are not clear to the audience, and odd things like direct address asides and musical interludes keep happening—but then not consistently enough to feel like there is a purpose to them. Rebekah Brockman is brilliant as the heroine of the story, Jo. Brockman is at once bitter, vulnerable, and witty as she struggles to cope with the abandonment of her mother and boyfriend. Brockman also has a wonderful rapport with John Evans Reese who appears in the second act as Geoffrey, Jo’s “effeminate” live-in companion who provides her with sincere love and care. Their scenes together are the delight of the evening. 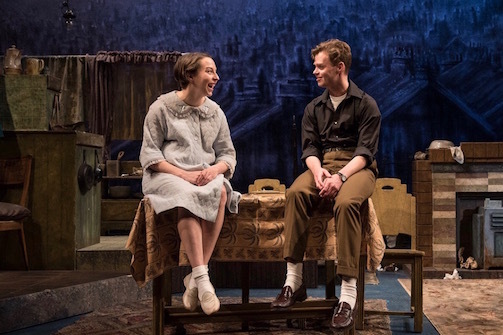 Overall, while the pace and dialects are uneven at times, the Pearl's production of A Taste of Honey is a fair revival of a rarely produced play. (A Taste of Honey plays at the The Pearl Theatre, 555 West 42nd Street (between 10th and 11th Avenues) through October 30th. The show runs approx. 2 hours 20 mins, with one intermission. The performance schedule varies greatly week to week, with evening performances at 7 (Sundays, Mondays, Tuesdays, Wednesdays, and/or Thursdays), and at 8 (Fridays and Saturdays); matinees are at 2 (some Sundays, Wednesdays, and Saturdays). Tickets are $59-$99. See pearltheatre.org for exact performance schedule. Tickets are available at pearltheatre.org or by calling 212-563-9261). A Taste of Honey is written Shelagh Delaney and directed by Austin Pendleton. It is produced by the Pearl Theatre Company. Scenic Design by Harry Feiner. Costume Design by Barbara A. Bell. Lighting Design by Eric Southern. Music Supervision by Jane Shaw. Music Direction by Phil Faconti. Casting by Jessi Blue Gormenzano. Assistant Director is Jack Serio. Dramaturgy by Kate Farrington. Production Stage Manager is April Ann Kline. The cast is Rachel Botchan, Rebekah Brockman, Bradford Cover, John Evans Reese, and Ade Otukoya. The musicians are Max Boiko (trumpet), Phil Faconti (guitar), and Walter Stinson (Bass).